1. ".....Examination of records shows that under the TAN mentioned above,you have deposited Tds for the financial year 2006-07,but you have not filed the corresponding quarterly statement as required under the income tax act....."
2. ".......if you already filed the tds return ,a copy of corresponding provisional receipt should be sent............" ".........late filing of TDS returns attracts penalty under section 272A (2)(k) of the Income Tax Act." 3. 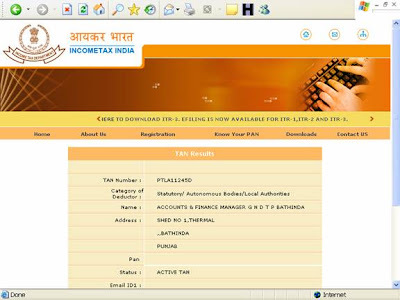 "....you are also required to quote PAN of all deductees in your TDS return. In case of non compliance of section 139A , A penalty of 10000/- Can be levied under section 272B." 4.In case more than one Tan have been allotted to you ,surrender the tan not in use. 6.you can check status of return by using Quarterly Statement status. 1. statement has already filled( against Tan in Case of which letter has been issued) & copy of Provisional Receipt No (PRNs) attached. d) Filed By head office. 1)In first point given above letter shows that "you have deposited the tds in financial year but have not filed the tds statement"
but the particular case i have dealt the deductor has not deposited any tax in 2006-07 on given tan. 2)In second Point written as"if you have filed the return send us PRN" so this point suggests that they have not fully confirmed regarding non filling of statement or there system might have some limitation. 3) in 3rd point they have asked to fill the pan of all the deductees in my opinion also, it should be done at any cost as it will improve our tax system. you should guide all ,near & dear about this.Never fill PANNOTAVBL,INVALIDPAN etc in haste while filling etds returns,as we have to file revised return for these pan. 4) In 4th point it is mentioned that "if filed on another tan than give another tan and prns. 5 & 6 self explanatory . In slip they have printed choices first" no deduction" means Evan though Nil return is not mandatory yet you have to answer the authority that you have not filed the return due to no deduction in a particular qtr. DEAR DDO ,You should give reply of the letter,otherwise notice will be issued or penalty can also be imposed by the dept. so in my view you should send prn(provisional receipt number) to nsdl and write the duplicate tan in the slip as received from tin-nsdl. The most important point i can conclude from this letter are given as under. 1. If one has issued/Allotted multiple tan than he should immediately surrender the tan/ tans not in use by following method. if you don't know whether you have allotted multiple tan the detail is given below at the end. 2. Use same tan for paying the tax and filing of return.if you wrongly deposited tax of one month of a qtr in a tan and other two month of qtr in another tan than please contact your tds assessing officer to correct the same before filling of your tds statement. 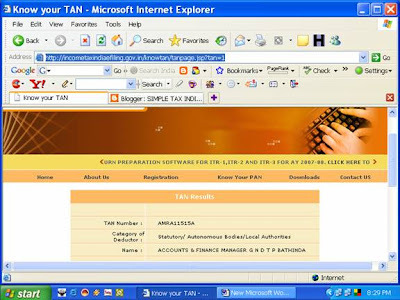 3. use consistently the same TAN for all your TDS related Transactions. 4. 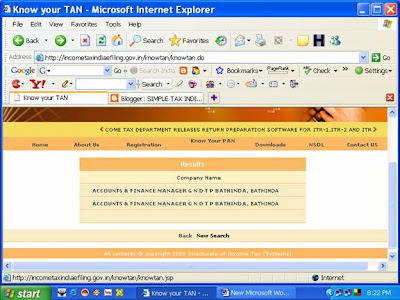 Use tin-nsdl website and facility given their under most of that also explained under my blog in different headings. 5. 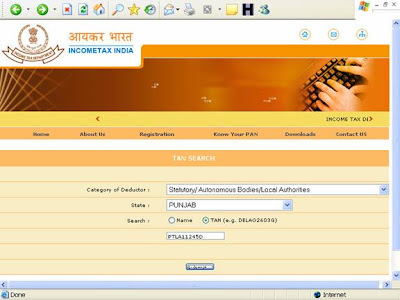 File your etds return on same tan under which you have deposited the TDS . The answer is always known to assesse but some time its wrongly issued by the dept twice or due to some other reason not known/communicated to assessee like in our region dept has issued another tan to all the assessees due to change in income tax range from Patiala to Amritsar and i think it may also be done in other region also.So one can check whether duplicate tan is issued on a given name or not. Copy name from the this window as in present case "ACCOUNTS & FINANCE MANAGER G N D T P BATHINDA" and paste in the link given above & select search by name and submit .